As President Obama gave a speech Thursday about Guantanamo Bay’s future, one group is pushing Americans to remember its past. The Guantanamo Public Memory Project is a traveling exhibit that explores the location’s expansive history, from its establishment in 1898 as a naval base to its role as a detention camp today. Led by Columbia University’s Institute for the Study of Human Rights along with the work from students at 12 other universities nationwide, the multimedia exhibit’s aim is to make visitors confront the occasionally hidden past of the notorious detention center. Students involved with the project took a semester-long class about the history of Guantanamo Bay and had to complete a part of the exhibit as their final project. They interviewed historians, archivists, past prisoners, guards, and family members in order to gain insight into what the detention camp was like through each of its different eras. The exhibit began traveling across the country in December and will circulate through nine cities until 2014. “We wanted to help people understand how Guantanamo was closed before only to be reopened and then closed again and reopened again. To show Guantanamo as not only the product of one administration but an enduring part of American policy and politics,” Sevchenko said. 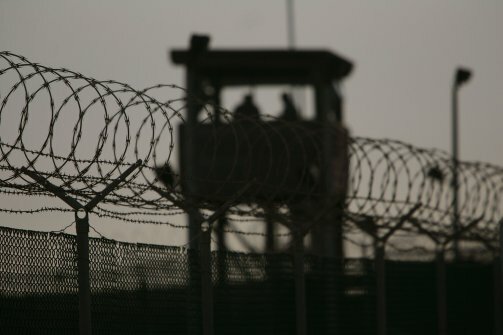 Guantanamo has been the source of political controversy recently as human rights groups criticize Obama for the way the administration is handling the 103 hunger strikes at the detention center and the fact that the facility has yet to close. The president addressed the criticism in his speech at the National Defense University on May 23 where he called on Congress to lift restrictions that kept him from transferring detainees to other facilities and ultimately shuttering Guantanamo. In acknowledgement of the hunger strikes at the camp, Obama said he would also lift the moratorium on repatriating Yemeni detainees cleared for release. The majority of the prisoners and strikers at the camp are from Yemen. Sevchenko hopes that by spreading the history of the infamous institution more people will be informed about the current debate over whether to shut Guantanamo down, and what the next steps should be. “We wanted to raise public awareness about the history about Guantanamo and to raise questions about what we face today,” she said. “Because what’s vexing the American public right now is why Guantanamo is so hard to close, and this is a question that seems more obvious if you understand that this space has been a fundamental part of our history, politics and culture for more than a century.